Little Footsteps in the Big World: Babymoon, yes or no? I've always been the traveling pregnant woman. And I'm a fan of babymoon. I've got several travel stories during my first pregnancy and they were all positive. With my pregnancy with baby girl, we did two big road trips at six-week pregnant. I flew to Warsaw at eleven-week pregnant. And I enjoyed every trip. On the other hand I know some ladies who think that traveling during pregnancy is a no no. Whether they don't feel comfortable (all the toilet trips, the morning sickness and the heartburn) or they're just simply tired. With me, traveling (except prenatal yoga, routine swims and regular office works, of course) kept me happy and active. And most probably, it got baby girl used to traveling from her earliest days. 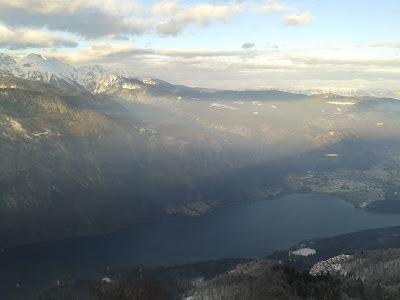 Before baby girl arrived, at eight-month pregnant we decided to do a so-called babymoon trip, for a prolonged weekend in the winter of early 2014, to Bled and Bohinj in Slovenia. It's not far from Zagreb, it's an amazing place, and we got to enjoy our last moments before baby. I'd really suggest first-time expecting parents to do babymoon. It's fun, it's relaxing (especially before birth), it's refreshing, and it's going to be impossible to do once you parent a newborn. I know many couple who do some kind of "honeymoon" trip after children, and leave their children back home with relatives, but babymoon is totally different. You don't have to call back home to check if your child is okay, you don't have to stock breast milk for whoever watches your baby at home to feed, it's simply another honeymoon like in the beginning of your marriage. Just with belly! With my second pregnancy that happened in December 2015, I was ready to start another big trip. We were planned to fly to Indonesia in the beginning of February 2016, and I was planning another babymoon in my head. However, at seven-week pregnant I was diagnosed with blighted ovum, which, surprisingly (and sadly) happen very often to healthy women, so we had to ended the pregnancy a few days before our flight to Indonesia. Of course traveling in pregnancy is not the same for everyone. Every pregnant woman should consult with their doctor before taking any trip, but if everything is okay with your pregnancy, there is no reason not to travel.